People who live here say it is a very friendly town. 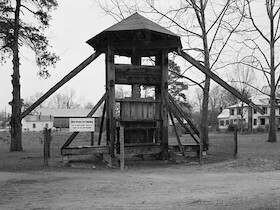 Tarboro is a small town of about 10,000 in east central North Carolina, about 15 miles from Rocky Mount. Thanks to its days as an important river port, Tarboro boasts a 45-block Historic District .The District has over 300 structures from residential dwellings to historic churches to original 19th century storefronts along Tarboro’s Main Street. It was created by the National Parks service in 1977. There is even an historic trail beginning at the Blount-Bridgers House that guides visitors through the scenic older neighborhoods of the town. The gateway to the Tarboro Historic District is the town’s Town Common, a 15-acre park canopied by tall oaks and war memorials. 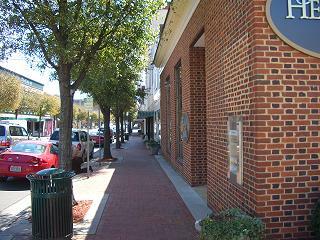 Photo of historic downtown Tarboro courtesy of Wikipedia and Brad Hufford of FoR ENC. Live in a historic home in the town or in an active community in the surrounding area. Zillow reports the median home value to be $79,100 in early 2019. The Blount-Bridgers House is an 1808 Federal-style mansion that houses several important document collections and works by nationally recognized artist and Tarboro native Hobson Pittman. The Historic District is very special. So are the low cost of homes and easy access to the coast of North Carolina. Tarboro is a very small town and it is not clear if it is going to be a popular town for retirees, given the weak real estate market and negative population trend. That being said, the town has its historical past, Carolina location, and a community that is working hard to promote itself. Tarboro is east of Raleigh and Rocky Mount, and north of Greenville in northeastern North Carolina. The average July high temperature is 88 and the average January low is 28. September is the wettest month (5"). The 45 block historical district and its beautiful period homes are part of the local culture. The Edgecombe County Cultural Arts Council and the Tarboro Artists Guild host events throughout the year. Some of the exhibits are in the Hobson Pittman Memorial Gallery, Blount-Bridgers House. There are concerts occasionally. Many restaurants in the downtown area to choose from. Crime rate is about average. Heritage Hospital with 117 bids serves the community. I 95 is nearby. The closest big airport is Raleigh-Durham, about 80 miles.